This is a continuation of my earlier post. Please refer to it for the methodology. A new part 3 can be found here. 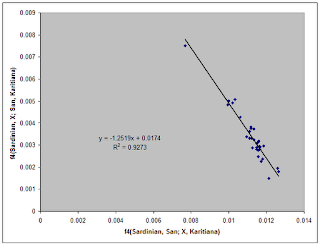 I used Sardinians as the Caucasoid reference population, Karitiana for Mongoloids, and San for Africans. The latter two were chosen because they live at maximally opposite corners of the Earth (South America vs. South Africa). 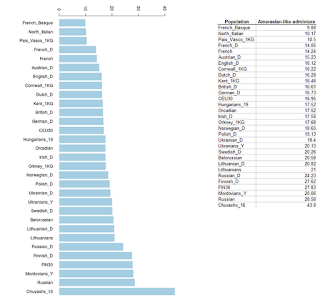 f4 regression ancestry estimation results are shown on the left. These appear to be much higher than was the case with the Han and Dai in the previous experiment. First, it is evident that northern Europeans have higher levels of this element than southern Europeans; the latter are not altogether deficient in it, but they fall "off-cline", making estimation of their admixture proportions more difficult. Second, within northern Europe, there is a fairly clear east-west cline of diminishing Amerasian-like admixture. The minimum occurs in Sardinians and secondarily in Southwest Europe. Romance, Celtic, and Germanic populations all have less of it than Balto-Slavic and Uralic ones. And, some populations of northeastern Europe seem to have a noticeable excess of it. The groups with the most Amerasian-like admixture possess Y-haplogroup N, a clear trace of eastern ancestry that is not shared by most Europeans. The arrival of this haplogroup, either with Comb Ceramic of the Baltic Neolithic or later with Seima Turbino Bronze Age expansions is probably responsible for the local excess in Northeastern Europe. The Chuvash are, of course, a Turkic population but of Finno-Ugrian genetic origin. But, the presence of this element even in Western Europe cannot be explained on the basis of typically Mongoloid elements which are almost completely lacking there. If Mesolithic Europeans were themselves Asian-shifted, then this would account for the presence of the element, but not necessarily for its clinal manifestation. The double (north-south and east-west) cline indicates every sign of an intrusive element. So, for the time being, I will propose that this is associated with late (e.g., Copper and Bronze Age) phenomena, such as the northern stream of the Bronze Age Indo-European invasion of Europe. or (ii), more likely, in my opinion, that the Y-haplogroup R1 group of people, whose closest relatives are in Central/South Asia (R2) , and whose more distant relatives (Q) are in Siberia and the Americas, were from the beginning an "intermediate population" between West and East Eurasia. The R1 group of people in its R1b and R1a varieties first appear in Europe during the Copper Age, and they are lacking in early Neolithic sites. In conclusion, human continental populations form groups of genetic and phenotypic similarity, and these groups can be considered races in the phenetic sense. However, these groups are not monophyletic, hence in the cladistic sense they should not be considered as valid taxa. Since the principle of common descent is generally applied in modern systematics (or at least it should! ), I think it's best not to recognize human subspecies. If these data pan out, it may be revealed that the European branch of the Caucasoids is actually a product of admixture too, with at least two of its constituent elements being the "Palaeo-West Eurasians" (Y-haplogroups G, IJ, possibly LT) and the "Neo-NW Eurasians" (Y-haplogroups N1 and R1), with the "Neo-Afrasians" (Y-haplogroup E1b1b) forming a third element. (A raw dump of fourpop output can be found here). It's actually possible to tease out these patterns with ADMIXTURE, although such exercises are limited by the variation found in modern populations. I've seen runs where, prior to the differentiation between different West Eurasian groups, East Eurasian admixture is found widely in Europeans and West Asians, with minima in Southwest Asians and Africans with significant West Eurasian ancestry (Afroasiatics). Which is interesting since Arabian and African Afroasiatics have very little Y-DNA R1. East African admixture is also detectable in the populations with the most Middle Eastern ancestry (particularly Arabians, but this element spills over into West Asia and Europe). However, while we may find clinal patterns, these experiments are inconclusive since we currently have no way of knowing what the ancestral populations were really like, and how they mixed to form the patterns of variation seen in modern populations. aDNA should help to solve this mystery in the future. Concerning “R1b and R1a varieties first appear in Europe during the Copper Age:” What about the Basques? -- Largely R1b, low Amerasian-like admixture and having a language with vestiges of the Neolithic? Are we not seeing waves of migration over time; but originating well before the Copper Age? "..within northern Europe, there is a fairly clear east-west cline of diminishing Amerasian-like admixture" How does this square with the increasing east to west cline of R1b, with Irish and Basque for instance over 90%? Widely, but not significantly. We're susually looking at a couple of percent at the deepest level of analysis (before having to divide up W. Eurasian populations into either 'Asian' or 'African' with no third alternative). This affinity in Western Europeans tends to be S. Asian rather than East Asian anyway. A lot of these Amerindian affinities *have* been detected before, though,(in Dienekes' ascertainment test and in the now-seemingly-abandoned Artemis project) just not at a figure anywhere near approaching 15% in, say, Britons. The Irish, for whatever reason, consistently get higher Amerindian readings than other NW Europeans, for instance. But this more often than not adds up to a greater percentage of non-W. Eurasian ancestry than is reported for that same population at an early K level. This suggests that the Amerindian affinity is W. Eurasian and not the reverse. The same effect is true of S. Asian affninities in Western Europeans. On closer analysis it's always revealed to be a Balochi component in NW Europeans, not a S. Asian/Australasian one. But I think the absurdity of the reported figures here can be summed up thus, referring to physical anthropology: An entirely non-Mongoloid influenced group, the Irish, have about 90% of the Asiatic admixture than has a noticeably Mongoloid-influenced group, the Poles. Strange, no? The same absurdity can be shown with any similar contrast of non-Asiatic and partially-Asiatic influenced populations: Finns have gone from being about one hundred times more Mongoloid than the Irish, in traditional Dodecad runs, to being less than two times more Mongoloid. Even the two percent difference in Asiatic levels between Irish and Scandinavians explained a lot, since while small in an absolute sense, as a proportion, the difference was multiple. Now we have to explain the striking differences between populations (between, say, Bjork and Brendan Gleeson) in terms of minimal fractions of ancestral difference. Finns have gone from being about one hundred times more Mongoloid than the Irish, in traditional Dodecad runs, to being less than two times more Mongoloid. It's the relative levels that counts. 0% in an ADMIXTURE run does not equal absence of influence, it means minimal influence in the context of the studied populations. So, even Sardinians who are the least Asian-shifted Europeans probably have some of this element, but noticeably less than other Europeans. As for the other remarks, you should not confuse the Mongoloid _phenotype_ with the East Eurasian _gene pool_. The former seems to have appeared in its full-fledged form later than the latter. Thanks for the response. Sorry, I should've specified a few extra things. I do understand about the relative differences. However, these recent figures do significantly bridge the relative gap between physically non-Mongoloid and part-Mongoloid groups in a way that doesn't seem to account for said physical differences. However, it's an interesting point that perhaps the physically relevant components I refer to are exactly what ADMIXTURE does detect, while not detecting so much the influence of earlier populations, for the reasons you stated. In which case we could be dealing with multiple layers of East Eurasian input, at several points of physical evolution, with the more recent affecting, essentially, only Eastern Europe (and peaking noticably in NE Europe). But might it be the case that proto-West Eurasians/Cro Magnoids were relatively shifted toward East Eurasians by virtue of undergoing a less intensive selection process than classical Caucasoid fertile crescent West-Eurasians, whose modern descendants -- all other, more recent admixture events being equal -- naturally shift less toward East Eurasians than the more CM-descended N. Europeans? Add to that the effects of W. Eurasian genetic presence in Siberia, and the fact of several later waves of Asiatic influence into *parts* of Northern Europe, we might then begin to see a complex picture that doesn't necessarily require direct admixture between Asiatics and all N. Europeans. But it is possible that the same-racehood of Cro-Magnon and fertile crescent people is a matter of convention, something we intuit because, for most N. Europeans, both types have always been around. This is all I can imagine is meant by Reich's reference to an 'admixture event' in Europe equal to that seen in S. Asia. As Dienekes pointed out Mongoloid phenotype appeared only after 20K years ago. And as recently as 2000 years ago non Mongoloid phenotypes often appear in East Asia. Yet most of them still were East Eurasian genetically. For example Ainu. Also Dienekes didn't say R1 was Mongoloid. He postulated that it was from a third population that contributed to both West Eurasians and East Eurasians. This has been suspected for a long time due to the otherwise unexplainable genetic closeness between East Asians and Caucasoids despite the expected contrary according to the strictly cladistic understanding of phylogeny. In this scenario while both R1a and R1b are ultimately from the East, R1a is more recently so thus more "East Eurasian". N is even more recent thus even more East Eurasian. so on so forth. But P group itself is a part of MNOPS group which seems to have an East Eurasian affintiy. This has yet to be resolved so I reserve my final judgment though. Yeah sure, why are North Africans part "negroid" (whatever it means) but Nooooo, Europeans are not mongoloid-influenced with their East Eurasian affinity. What we "usually" see is dependent on the samples used (often biased toward West Eurasians), and of course the K value. See, e.g., K=3 in this run. East Eurasian reaches 15-20% in Russians, with an average near 9% in Orcadian Brits, and over 7% in Georgians. Not saying these estimates are ideal, just some food for thought. Also of slight interest in that run's (Harappa's) K=3 is that, related to Dienekes' latest piece, Papuans do show a European element, which reveals itself at later Ks to be South Indian. Obviously, S. Indian isn't European, but European did act as a proxy for it while it was waiting for its proper category. This really brings up the question of at what point the admixture proportions, even if we can ever get them to agree, become meaningful. After all, at K=2, all West Eurasians are split between Africans and Eurasians, according to that run. Whether there was ever a pure 'West Eurasian' (or East) population, or whether it's always been just relative I suppose is the question. I would be very interested in knowing how this ancient East Eurasian-like admixture manifests itself physically in modern Europeans, though. I personly believe that blond hair/light eyes alleles are part of the northern european component for example. But they are just a tiny fraction of the whole package. Less than 0,1% or so most likely. So, I could imagine that its possible tho have 5% East-Asian Admixture without showing mongoloid features and someone else having 0,5% East Asian and does show mongoloid features, because these 0,5% may be exactly the alleles that cause that facial features. In the same time you can be blond and blue eyed without measureable "Northern European", because its like 5 alleles that make you blond and blue eyed. I remind to the blabla of classical anthro guys who say: "This guy is a paleolithic survivor and this one is mesolithic and that one is a iron age migrant! And all this they do by looking at photos. I am pretty sure that admixture wouldnt show any difference between them. Because it wont recognize the 30 alleles that make you look like a mesolithic guy as a component on its own. This isn't relevant when we're talking about proportions, though. If Euro features are the product of 100 alleles and Asian features are the product of 100 alleles, and they blend together to make children with 50 European alleles and 50 Asian alleles, then this is no different than if we add ten zeros to each number. The only difference with smaller numbers is greater susceptibility to drift. Regardless of numbers of alleles, ethnicities that are 20% Mongoloid (which issue we've kind of already settled -- Mongoloid features may be more recent) should look roughly 20% Mongoloid, notwithstanding selection and genetic dominance. Moreover, even if certain features are recessive and certain features are selected out or lost to drift or whatever, we should still expect to see the reemergence from time to time of these anciently introduced traits, which one doesn't see in NW Europeans particularly often (despite input from more recently easterly-mixed populations, such as Scandinavians). Again, this is true of individuals, but not of populations. Even populations that haven't achieved a stabilised blend will turn out individuals with an ancestrally proportionate or even ancestrally overproportionate phenotype from time to time. This isn't true of, say, any nation of the British Isles, despite those 16/17% figures. Of course, however, the age and nature of the East Eurasian component is still unknown. Fanty, its an old idea. There is an old Hitlerjugend manual on the web that talks about how you cant judge how nordic someone is just by physical phenotype (appearance) but ultimately only by character (psychic phenotype or whatever) but without the technical jargon. It would be interesting to know how many genes are involved in skeleton etc. vs. character and how much stability there is in the associaton of the two. It may be that a local section of the population with consistent and pronounced nordic appearance is more likely to preserve the original associated psychic traits due to less admixture. So if one wanted to breed classic nordic psychic traits it might make more sense to select local groups rather than scattered individuals. Of course one could defer procreation until character had been observed long into adulthood, a sort of phenotypical meritocracy but it would still leave questions of how consistently the character is transmitted in an already admixed population. We may already know the answers to this stuff from animal husbandry, with some parallel between eg. throughbred horses and the human thoroughbred (eg. ideal aristocrats.) With modern cloning we could probably reproduce lost aristocracies if we wanted to improve the population. AFAIK the classical anthro types are meant to give an idea of what physical (visible) traits are associated with which population strata. It doesnt mean that the classic visual example is pure. The Irish have diverse phenotypes, we're not all red-haired and freckled, LOL! I have jet black hair, no freckles on my face and green eyes. My parents are Irish from Ireland, my father is 100% Native Irish AFAIK, he and a few other siblings had partial epicanthical folds, as do I and some siblings. I'm not sure how this relates to a 20% foreign contribution to a genepool not leaving behind physical traces. Having lived in the British Isles my entire life, I don't really require enlightenment on what NW Europeans look like. Many Scandinavians and E. Europeans look strikingly Mongoloid to me, so I can easily dismiss a finding that suggests that, say, Irish are about 90% as Mongoloid as Poles. However, as Dienekes suggests, the East Eurasian may well not be Mongoloid as we understand it today. Indeed, R1 carriers are a massive influence in Northern Europe, so these aren't people whose genetic contributions are hiding, unless they're hiding in plain sight -- the carriers of R1 are reproduced all around us in the faces we see daily. Metrically, the primary (and one of the only) difference between Basques and NW Europeans is CM admixture. Is this where the E. Eurasian is expressing itself (partially)? Certainly Cro Magnon man, to me, doesn't look any further shifted toward modern E. Eurasians than do classical Caucasoids. But this could be a psychological prejudice. Still, one would expect an admixture event (as Reich refers to it) that was the origin of the European people to leave behind it much clearer evidence of two originally heavily differentiated groups, however mixed they may now be (re. S. Asia). Otherwise, we'd have to consider some form of parallel evolution. It's fascinating to me that diverse Y and mtDNA lineages have descendants who appear to be essentially of the same stock. Perhaps these types of findings will undermine that, but, still, these possibly massive internal, deep-rooted genetic differences still seem to have a strikingly cohesive ouydryFlter coating. Just to add @ pconroy: Partial epicanthic folds are common among West Africans too. Moreso than among Europeans (even Eastern Europeans). They're not ancestry indicative. Instead of using R1 and N as a source of the east Asian shift, maybe it would be better to use mtDNA group W. It has a distribution that is similar to R, but in Europe it is present only at very low levels. It does seem to have a similar cline north to south and east to west as discussed here. 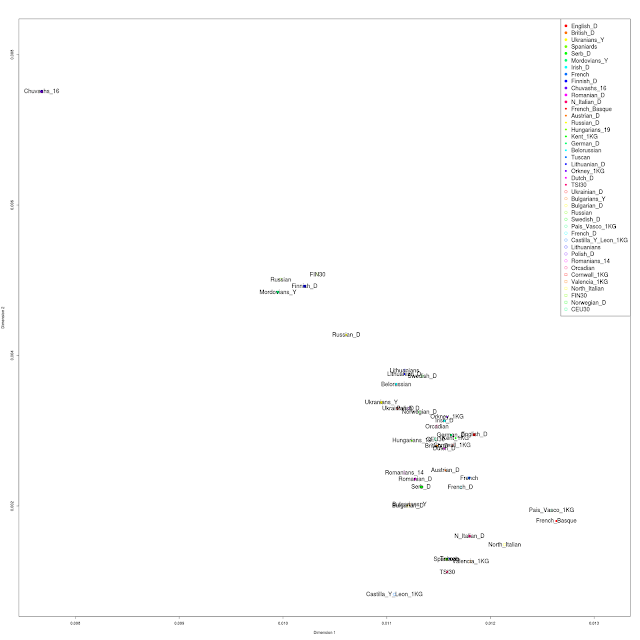 The low level of distribution spread out very wide suggests that the admixture is much older than, say, R1a. "However, these groups are not monophyletic, hence in the cladistic sense they should not be considered as valid taxa". Many species are not monophyletic in a haplogroup sense but are still considered valid taxa. There is no reason not to consider the various human populations as separate taxa. Except in most cases it would be almost impossible to define any boundary. An obvious exception would be the very marked boundary between Australoid and Mongoloid, separated by Wallace's Line. "I used ... Karitiana for Mongoloids"
Wouldn't Evenks or Yakuts be a better reference population for Mongoloids? They appear to have the most marked Mongoloid characteristics whereas it seems very likely that the Amerindians are far from being a representative Mongoloid population. They are very likely admixed with some early Central Asian people. "As Dienekes pointed out Mongoloid phenotype appeared only after 20K years ago". We don't yet know when or where the Mongoloid phenotype first appeared. It may be older than 20k. A priori, that seems right, but they're apparently less related to Europeans than are South American natives. I think there are quite a few peripheral issues that might help shed better light on all of this and tell us exactly what it is we're looking at. Firstly, it'd be great to have some (non-arctic) North American native samples for comparison. Given that the East Eurasian in Europe has been suggested to be North Siberian, and, physcally, North American natives appear to be more of north Siberian descent than do South American natives, who appear even Australasian admixed (though I've not seen any genetic support for this), and at the very least seem more akin to SE Asian populations (which may be linked to the point above). Other issues to resolve might include why, when levels of Haplogroup N are almost equal in Finns and Lithuanians, are Finns so much more Asiatic in ADMIXTURE runs than Lithanians? 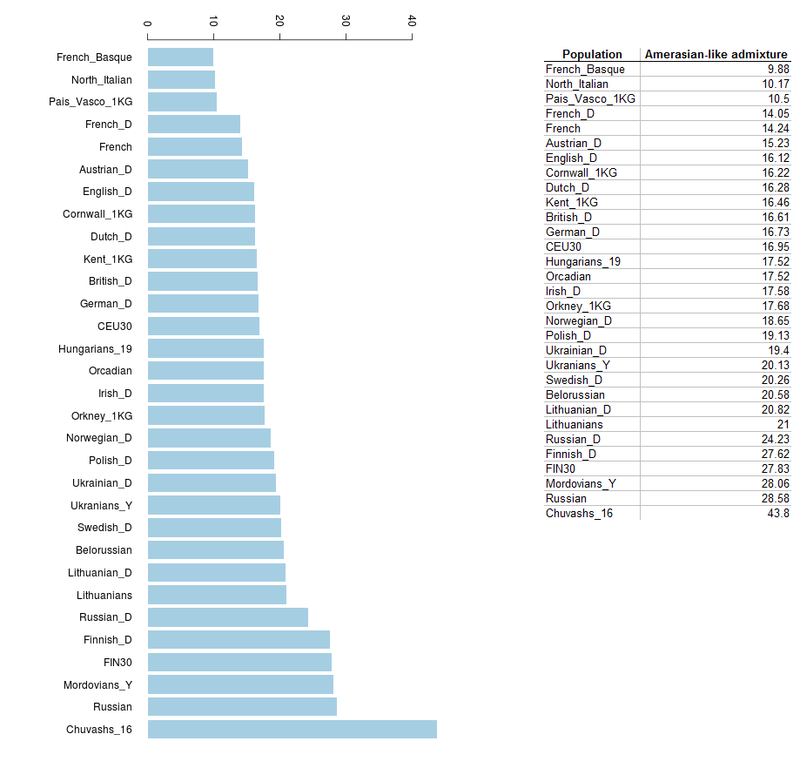 -- Finns being around 8-10%, depending on the K level, and Lithuanians around 1.5-2.5% -- about the same as other Eastern Europeans (obviously at K=3 the proportion is higher, but this is true also for N-less populations). An Estonian sample could well shed some light. Where are the Saami in all of this? I've still to see an autosomal study on Lapps. I eagerly await Reich's paper. But it's not just partial epicanthic folds I'm talking about, it's wide face, low nasal bridge, straight jet black hair, slender body-type. People always mistake her for some sort of Eurasian hybrid. BTW, Polako/Devidski in his old analysis found some Selkup in my Father and some Chukchi in my Mother, on other analysis my Mother seems to have some Athabascan ancestry. DNA Tribes found a minor Arctic component in my Father. On HarappaWorld calculator, my Father shown a minor component of South American Native ancestry. So it's a consistent genetic component, and shows up in the phenotype too. I take it you're an American of Irish descent. Please don't suggest I don't know what my own people look like (I'm 7/8ths English and 1/8th Irish). I've seen millions of Britons in my lifetime and I'm very observant. It's not just the 'Bjorks' of Scandinavia that I notice. I see it in more subtle expressions too. And I can tell you that it doesn't express itself very often in any British population. It's there, of course. We were settled by Scandinavians, but it's far less than one would expect if Hungarians (in whom Asiatic features are very common) and the Irish were precisely as East Eurasian as each other (assuming that the East Eurasian in both is expressed physically as Mongoloid or even proto-Mongoloid). As for the genetic tests, if you're attempting to convince me that most genetic tests find the Irish as East Asian/Native American admixed as Eastern Europeans, don't bother. They don't. A slight correction to my previous post: My mistake, I slightly misread (or misremembered) terryt's point. I'd say this: I think the insertion of Karitiani was to explore the N. Euro/East Eurasian relationship to its fullest (since it's presumably the best, or one of the best, non-Arctic Amerindian groups available), not because they're the best representatives of Mongoloids. However, it's a shame that some of the best groups to test the relationship (i.e. North American natives) are already quite mixed. No, I'm 100% Irish, born and raised in Ireland - so NO Native American or Colonial US ancestry. My father also is 100% Native Irish AFAIK, with no external ancestry, including Norman or otherwise - though due to the preponderance of German relatives, he may have some unknown Palatine German ancestry. I've seen millions of Irish people first hand, and you get people like my sister's and aunt's phenotype quite regularly, but probably less than 5%. My mother shows a component up as 8% Hungarian in HarappaWorld calculator - though her only non-Irish ancestry is Northern English and French Huguenot. I have a great memory of faces and score extremely high on facial recognition - so don't tell me what I can see or not in Irish faces, OK.
What we really need is, the alleles that led to visible differences. I hate it that it seems we only know a fraction of it. We seem to know how blond hair, red hair and light eyes are defined. We know what alleles make attached earlobs or longer 2. toes. We know what alleles produce curled hair or what do freckles. Pitty no one ever makes a map of these. Well... so we already know all this useless things... but why on earth does it look like we have no clue what alleles produce mongolid looks? It should be possible to produce maps/percentages of these alleles, if we knew them? That wasn't what I was implying. Ignorance of Europe and a strong New Age extolment of Native Americans (which I assumed would be the basis of your illogic here, especially since I've seen you remark on Orcadians' nought point whatever Siberian levels as being 'the most interesting feature of their ancestry') is something I associate more with Americans. It's a pity you're Irish. But I suppose it's left to me to raise the point that the Irish aren't the centrepiece of my argument anyway, and that I can do without them. Take another group -- the Cornish -- who even you couldn't argue looked as Asiatic as Hungarians, despite getting comparable levels on these latest runs. My point survives your confusion of Cro Magnon features among the Irish as 'Asiatic'. Well, East Asian features can coexist with blond hair (e.g. Sissy Spacek). The blondest region of Europe is the NE, after all. To do what you want, you'd have to identify all the genes that compose the complex tapestry of bone structure, for instance, and understand their interaction with similar genes from a different source. Rather, the simplest way is observation of groups we know to be admixed. Finns are a massive help in this regard. The better question is under what threshold would Asiatic features in a population become invisible to the average eye? Well, I can read people like a book. If you propound obvious falsities, and I can clearly see the reasons why, I'm going to call you on it. It's how I roll. You've implied that you disagree that Eastern Europeans are visually more Asiatic than the Irish (and NW Europeans in general) so I'm hardly going to be upset at being insulted by a man of your oh-so stellar intellect and knowledge of anthropology. I've read a few of your comments in the past and haven't been remotely impressed, either with the grammar or content, so I couldn't really care less about your 'credentials' (and internet credentials at that). I would, however, be interested in seeing you attempt to respond to anything I've actually posted in this thread. If you can, that is. If not, feel free to send me another utterly worthless reply. I offered images and DNA results as evidence, you have only offered your personal opinion. I must say I'm impressed by your aparent ability to read peoples DNA visually - perhaps you ought to patent that technique?! I'm assuming you're familar with Dodecad's results? Eastern Europeans average around 1.5-3% Irish around 0.1-0.3% Now if these figures were absolute, they'd make sense. It's relatively low in all groups, yet being multiple times (up to ten times) more common in Eastern Euros than NW Europeans can certainly explain the multiply more Asiatic looks of the one group than the other. I'm not sure what part of this is bothering you. Maybe, but only if the initial East Eurasian admixture that's present even in Basques (if it is) were more even distributed throughout Europe than those later waves. As for reading your 10,000+ posts, nope. Think I'll pass. I've read more than I need to. Btw, you misspelled 'peruse'. I'm not trying to get into your argument, but it does occur to me to mention that for the fascinating experience of viewing northern European faces with a fairly significant east Siberian admixture, I can really recommend the recent Russian fiction film which is released as "Silent Souls" or "Buntings" in English. Filmed in the boreal forest amongst the Merja people, I'm pretty sure that all the supporting actors at least must come from this group as they are very distinctive looking. The group was colonised by the Russians a few hundred years ago and consequently lost their language and religion but the film is concerned with showing how various aspects of their ancient culture survive. "A priori, that seems right, but they're apparently less related to Europeans than are South American natives". That is actually the point. They are basically separate from either. Perhaps they are admixed with another ancient Homo species different from Neanderthal of Denisova. "I slightly misread (or misremembered) terryt's point. I'd say this: I think the insertion of Karitiani was to explore the N. Euro/East Eurasian relationship to its fullest (since it's presumably the best, or one of the best, non-Arctic Amerindian groups available), not because they're the best representatives of Mongoloids. However, it's a shame that some of the best groups to test the relationship (i.e. North American natives) are already quite mixed". I'm sure that Amerindians are admixed anyway. They appear to be a mix of Mongoloid and Caucasian, the Caucasian presumably picked up during (or originating from) their route east from the steppes. So they already carry West Eurasian genes, although it appears that the level of Mongoloid admixture decreases as you move south through America. "North American natives appear to be more of north Siberian descent than do South American natives, who appear even Australasian admixed"
To me that suggests that South American natives are far less 'Mongoloid' than are North American natives. In mainland Eurasia we see evidence that haplogroups carrying the Mongoloid phenotype have moved north since the settlement of America. But that Mongoloid phenotype has later managed to reach into North America. Overall this suggests that the East Eurasian admixture found widely in Europeans and West Asians is not Mongoloid but Central Asian. However I'm sure that Y-DNA N is a product of Mongoloid entrance. But we seem in this post to be dealing with an older 'East Eurasian' element, but probably including the more recent N expansion. "Other issues to resolve might include why, when levels of Haplogroup N are almost equal in Finns and Lithuanians, are Finns so much more Asiatic in ADMIXTURE runs than Lithanians?" Haploid DNA is not necessarily directly proportional to autosomal DNA. Usually the haplogroup will travel further than the aDNA, but this is not always so. "We seem to know how blond hair, red hair and light eyes are defined". Not really. We know 'some' of the genes involved. If you look at the runs in that same blog entry, Amerindian seems to be playing havoc with the admixture estimates of more than just Northern Europeans populations -- even sub-Saharan Africans. Pay attention to the North Eurasian group. It's very mixed with West Eurasians. Overall this suggests that the East Eurasian admixture found widely in Europeans and West Asians is not Mongoloid but Central Asian. However I'm sure that Y-DNA N is a product of Mongoloid entrance. But we seem in this post to be dealing with an older 'East Eurasian' element, but probably including the more recent N expansion. You're right: it's not Mongoloid. There are steep clines of Mongoloid infiltration in Europe, and these new estimates seem to 'equalise' Mongoloid admixture (supposing we take it to be Mongoloid admixture) to an unrealistic degree. Mongoloid phentotypes are so rare in Britain that sophists usually resort to using people of substantial non-British ancestry to 'prove' it exists here at all. Take Michael MacIntyre, who's half Hungarian and half Canadian (components involved in the latter ancestry portion aren't known). If East Eurasian is here at all, it's something more ancient, less recognisable. I know, but the similarities by one measure of admixture and differences by another for the Finns and Lithuanians could contain clues to the age of the admixture, how many waves of it occurred, and over what period etc. After all, a population that Y-chromosomally is about 40% 'East Eurasian', but autosomally only 1.5-4% (depending on the K level) East Eurasian is a conundrum. The whole discussion about "mongoloid" features is very chocking and childish to me and can lead to very biased views of the results we get and alter the way we think ancient migrations. Even Dienekes is in my opinion overusing "-oid" terms and assign them to genetic clusters: I think it's a bad habit. For example, equating African affinity (and ancestry) with "negroid" ancestry. Apart from the fact that "negroid" is not accurate at all to describe the diversity of subsaharan Africa, there are usually very few to only one cluster found in ADMIXTURE runs for instance. My point is that there is no reason to assign modern appearances (superficial) to ancient migrations in the results we get through genetics. Or at least not until we have more evidences. I don't deny that modern populations that are mainly of west eurasian ancestry usually look "caucasoid" of course. Anyway, I think the results are quite in line with what we already know about European affinity to East Eurasia, and it was already very clear in northern European populations. The only change is that now, Europeans (all of them) aren't considered "pure" west eurasians anymore and are as mixed as Middle Easterners, North Africans etc. @idurar An unfortunate but inevitable attempt to clog up a reasonable line of argument: that biogeograhical ancestry corresponds with physical appearance. Numerous times have I suggested that, depending on the age and proportion of such admixture, some 'East Eurasian' influence may contribute to the basis of, rather than detract from, what today we consider European. This, however, is obviously only part of the story, because it's certainly true that some East Eurasian ancestry *does* detract from what we consider European, as is the case in much of Eastern Europe and Scandinavia. Some Northern European populations. And it's a bold claim you make, since the amount of the admixture in all Europeans isn't yet known, not to mention that North Africans and Middle Easterners themselves don't have comparable admixture. How can Europeans be as mixed as North Africans and Middle Easterners, when North Africans and Middle Easterners each have completely different levels of admixture?